Although Chlamydia trachomatis is the most commonly reported pathogen that causes urogenital infection such as urethritis or cervicitis, Ureaplasma parvum and Ureaplasma urealyticum, which are commensals in the genital tract, have also now been recognized as contributors to urogenital infection. However, whether the presence of either U. parvum or U. urealyticum is related to that of C. trachomatis in the urogenital tract remains unknown. We therefore attempted to estimate by PCR the prevalence of C. trachomatis, U. parvum and U. urealyticum in endocervical samples obtained from healthy women attending their first prenatal visit in Sapporo, Japan. The samples were taken from 303 apparently healthy women, and the extracted DNAs (n = 280) were used for PCR detection targeting C. trachomatis, U. parvum and U. urealyticum. Statistical analysis of the data was performed by Fisher's exact test. PCR detection revealed that the prevalence of C. trachomatis, U. parvum and U. urealyticum was 14.3% (40/280), 41.7% (117/280) and 8.9% (25/280), respectively. C. trachomatis ompA genotype D was most frequently identified. Surprisingly, either C. trachomatis or Ureaplasma spp. was detected in almost half of the healthy women. Mixed infection of C. trachomatis with either U. parvum or U. urealyticum was also observed in 9.2% (26/280) of the women. There was a significant association between C. trachomatis and either U. parvum (p = 0.023) or Ureaplasma total (p = 0.013), but not U. urealyticum (p = 0.275). This study demonstrated that the presence of Ureaplasma had a significant effect on the presence of C. trachomatis in the genital tract of healthy women, suggesting that mixed infection is an important factor in bacterial pathogenesis in the genital tract. Urogenital tract infections are a major cause of morbidity in sexually active individuals worldwide, therefore, the World Health Organization has stated that sexually transmitted diseases (STDs) rank second in importance after cancer as treatable diseases in women. In particular, Chlamydia trachomatis is the leading cause of bacterial STD, with an estimated 5 million new cases annually worldwide [1–3]. C. trachomatis infection can cause testicular atrophy, epididymitis and orchitis in men, and ductal obstruction, pelvic inflammatory disease, tubal occlusion and extrauterine pregnancy in women [4–9]. However, the aetiology of most cases of chlamydial infection is undetermined and it could be multifactorial in nature, because of complications with commensal bacteria or mixed infections with other pathogens [10–12]. Therefore, the prevalence of C. trachomatis and other pathogens needs to be investigated. Ureaplasma are currently separated into two species: Ureaplasma urealyticum and Ureaplasma parvum, which are both thought to be genital tract commensals [13–17]. They are commonly found in healthy persons, therefore, their pathogenic role can be difficult to prove in a small population of individuals. Meanwhile, several studies have reported that Ureaplasma are associated with some diseases including non-gonococcal urethritis, pregnancy complications and prenatal infections, more often than are normal flora [18–20]. Thus, it might be that Ureaplasma perturb homeostasis in the genital tract, which provides a survival advantage for C. trachomatis. However, data regarding mixed infection of C. trachomatis with Ureaplasma are limited [13–15]. In the present study, we therefore attempted to estimate by PCR and culture (C. trachomatis, inclusion forming assay; Ureaplasma, urease test), the prevalence of C. trachomatis, U. parvum and U. urealyticum in healthy women attending their first prenatal visit at a community hospital in Sapporo, Japan. C. trachomatis D/UW3 Cx strain (VR-855) and U. parvum (ATCC-27813) were purchased from ATCC (Manassas, VA, USA). C. trachomatis and U. parvum were propagated in the HEp-2 cell culture system  and PPLO medium [1.5% (w/v) PPLO powder, 20% (v/v) horse serum, 5% (w/v) yeast extract, 1% (w/v) urea, 0.1% (w/v) phenol red, antibiotics (10 μg/ml vancomycin; 1 μg/ml amphotericin B), pH 6.0], respectively. The numbers of infectious progenies for C. trachomatis were determined as inclusion forming units (IFU) by counting chlamydial inclusions formed in HEp-2 cells using fluorescein isothiocyanate (FITC)-conjugated monoclonal anti-Chlamydia antibody specific to Chlamydia lipopolysaccharide (LPS) (Denka Seiken Co. Ltd., Tokyo, Japan) . The numbers U. parvum were also determined as colony-forming units (CFU) by counting colonies formed on the PPLO agar under a phase-contrast microscope. Three hundred and three samples were obtained from apparently healthy women attending their first prenatal visit at Toho Obstetrics and Gynecology Hospital [number of deliveries, 1,332 per year (2010); number of caesarean sections, 310 per year (2010); number of vacuum extractions, 106 per year (2010)], located on the outskirts of Sapporo City, Japan, from July 2010 to September 2010. The average age (± SD) of healthy women attending this hospital was 28.28 ± 5.25 years, and the age distribution was as follows: 94 (20-24 years), 93 (25-29 years), 59 (30-34 years), 25 (35-40 years), and nine (> 40 years). The samples were collected by scraping the endocervix of each woman with a sterile cotton applicator. The applicator was immediately immersed and resuspended in 1 ml sucrose-phosphate-glutamic acid buffer [SPG: 0.2 M sucrose, 3.8 mM KH2PO4, 6.7 mM Na2HPO4, 5 mM L-glutamic acid (pH 7.4)], and stored at -80°C until use. Written informed consent was obtained from all women, and the study was approved by the ethics committees of the Faculty of Health Sciences, Hokkaido University and Toho Obstetrics and Gynecology Hospital. One hundred microlitres of SPG solution in each sample was used for DNA extraction using a QIAmp DNA mini kit (Qiagen, Valencia, CA, USA), according to manufacturer's instructions. The solution was centrifuged at 18,900 × g for 30 min. Pellets were then used for DNA extraction. The DNA was eluted in 50 μl of the elution buffer supplied with the kit, quantitated spectrophotometrically and stored at -20°C until use. Table 1 shows primer sets and conditions for PCR amplification of C. trachomatis , U. parvum , U. urealyticum , and most bacteria . The quality of extracted DNA was confirmed by PCR amplification using universal primers that target bacterial 16S rRNA, which is conserved across a broad spectrum of bacteria. DNA samples that resulted in negative PCR for bacterial 16S rRNA were discarded. Finally, the samples (n = 280) that yielded PCR products of the expected size were used for PCR amplification of C. trachomatis (target gene, ompA) , U. parvum [target gene, 5' ends of the multiple-banded antigen gene (MBA) with upstream region]  and U. urealyticum (target gene, MBA with upstream region) . Template DNA (2 μl) (average amount of DNA per sample: 63.64 ± 89.16 ng/μl) was used for each PCR. Reactions were carried out in 25 μl reaction buffer [each dNTP, 200 μmol; 1× commercial reaction buffer (New England Biolabs, Herts, UK)] containing Taq DNA polymerase [0.625 U Taq DNA polymerase (New England Biolabs). The PCR cycle consisted of 10 min denaturation at 94°C followed by 30-45 cycles, each of 30 s denaturation at 94°C; 30 s of annealing at 52-58°C; and 45 s of extension at 72°C. The amplified products were separated by 1.2% agarose gel electrophoresis and visualized by ethidium bromide staining. Each PCR was performed at least two times, for confirmation of PCR specificity and reproducibility. In addition, to prevent contamination, the preparation of the PCR mixture was performed in a separate room. All products of ompA amplified in C. trachomatis-positive specimens were fully sequenced (Macrogen, Seoul, Korea) and each of the genotypes was determined through BLAST search. Lineage analysis with ompA sequences was also performed by the following method: C. trachomatis ompA sequences were aligned with MUSCLE software . Then, the phylogenetic tree was constructed using the neighbour-joining method with MEGA5 software . The following reference sequences were used: A/Sa1 (M58938), B/TW-5 (M17342), C/TW3 (M17343), D/B-120 (X62918), E/Bour (X52557), F/IC-Cal3 (X52080), G/UW57 (AF063199), H/Wash (X16007), I/UW-12 (AF063200), J/UW36 (AF063202), K/UW31 (AF063204), L1/440 (M36533), L2/434 (M14738), and L3/404 (X55700). Chlamydia muridarum MoPn (M64171) was also used as an out-group sequence. The gene accession numbers of sequences identified in this study were deposited in "DNA Data Bank of Japan" and available from authors upon request. To determine the detection limit of PCR for C. trachomatis and Ureaplasma spp., spike experiments were performed. U. parvum was used as a representative Ureaplasma. Several sets of 100 μl of SPG solution in the pooled swab samples, which proved negative for C. trachomatis and Ureaplasma, were prepared. The sets were spiked with serial dilutions of either C. trachomatis VR-855 from 10-2 to 104 IFU or U. parvum ATCC-27813 from 10-1 to 105 CFU per sample. The DNA extraction of spiked samples, as well as from clinical specimen, was used for the PCR-detection method with primer sets targeting to C. trachomatis ompA and Ureaplasma MBA as described above. The presence of infectious C. trachomatis in the samples confirmed as C. trachomatis-PCR positive was determined by inclusion formation assay on HEp-2 cells. The presence of viable Ureaplasma in the samples confirmed as either U. parvum or U. urealyticum PCR-positive was also determined using a urease assay as follows. In brief, a sample solution of 5 μl was diluted to 100 μl with SPG, and then passed through a filter with a 0.22-μm pore size. The filtrate was cultured in a total of 200 μl of PPLO medium at 37°C for 7 days. Samples that turned from yellow to red after the incubation were considered Ureaplasma positive. Comparison between the frequency of C. trachomatis and that of U. parvum or U. urealyticum was done by Fisher's exact test (two-way ANOVA; Statview, Abacus Concepts Inc., Piscatway, NJ, USA). A p value < 0.05 was considered significant. We assessed by PCR amplification the bacterial flora in the genital tract, to confirm whether extracted DNA was suitable for PCR amplification that target C. trachomatis or Ureaplasma spp. Three hundred and three samples were individually assessed by PCR with a primer set targeting bacterial 16S rRNA. The average amount of DNA was 63.64 ± 89.16 ng/μl, which indicated successful DNA extraction, therefore, it was expected that all samples would be available for PCR. However, in 23 samples (9.2%) PCR failed to amplify 16S rRNA gene, even though the amount of extracted DNA was never low. Therefore, the 23 samples without amplification were omitted and the remaining 280 were used for this study. Standard PCR techniques, which can be applied to analyse the entire microorganism community of complex biological samples obtained from living individuals, has been universally used. However, it is well known that haemoglobin, lactoferrin, heparin, and bile acids, which are ubiquitous to environments such as the genital tract, inhibit PCR amplification . This suggests that it is absolutely necessary to check the DNA quality carefully to confirm successful PCR amplification from genital swab samples. The detection limit of the PCR for either C. trachomatis ompA or Ureaplasma MBA with upstream region was examined by using DNAs extracted from the pooled genital swabs [confirmed that all targeted bacteria (C. trachomatis and Ureaplasma spp.) were negative] that had been spiked with defined numbers of either C. trachomatis or U. parvum. The detection limit of the PCR in spiked genital swabs for C. trachomatis and U. parvum (as a representative Ureaplasma) was 1 IFU and 100 CFU per 100 μl of swab sample, respectively. The spiked samples revealed that the PCR system allowed stable and sensitive detection of each target DNA. Although the PCR primers that targeted C. trachomatis ompA for C. trachomatis detection were used for this study, it has also been shown worldwide that cryptic plasmid gene permits detection of C. trachomatis from clinical specimens [26–28]. However, so far it has also been reported that there is absence, variation or deletion of the plasmid in C. trachomatis [29–31], in particular, causing a clinical problem with false-negative results for C. trachomatis in Europe [29–31]. Although plasmid copy number is generally much higher than that of a genomic gene, which increases the sensitivity of PCR detection, we did not use cryptic plasmid for PCR targeting of C. trachomatis detection to prevent false-negative results. Detection of U. parvum and U. urealyticum with PCR primers targeting MBA genes with variable regions has been well documented for Ureaplasma detection [13, 32–36] therefore, we selected this gene for PCR detection of Ureaplasma spp. In fact, as shown in Figure 1 (representative PCR results), each of the PCR products was clearly visible, permitting us to make accurate judgements. Representative PCR detection images showing C. trachomatis, U. parvum and U. urealyticum amplification. N, negative control (molecular grade water); P, positive control (DNA extracted from each of the bacteria). 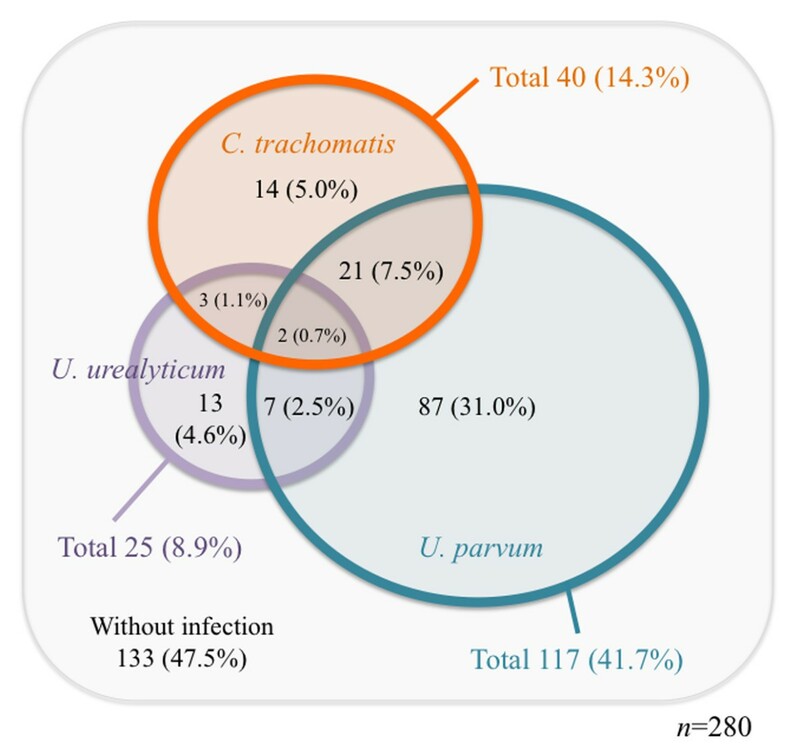 As shown in Figure 2, PCR detection revealed that the prevalence of C. trachomatis, U. parvum and U. urealyticum was 14.3%, 41.7% and 8.9%, respectively. The prevalence of C. trachomatis in healthy women has been estimated worldwide. The detection frequency among healthy women varies between countries and cities (46% Colombia ; 22.9% England ; 3.9% USA (Baltimore) ; 0.2% Australia ), probably depending on prevailing environmental factors and population living habits. However, its infectious frequency is believed to be around 10% on an average from a global perspective [1, 2]. As compared to other studies with healthy women in Japan (~5.8% on average; 3.0-3.8% Tokyo [39, 41]; 5.6% Fukuoka ; 8.3-8.8% Miyasaki [43, 44]; 1.7% Nasushiobara ; 9.5% Wako ), the prevalence of C. trachomatis in Sapporo City that we estimated (14.3%) was unique. Our result is supported by a previous study showing a C. trachomatis detection frequency of 11.3% in Sapporo . Thus, the prevalence of C. trachomatis in Sapporo, Japan, is likely to be high. Although we cannot explain the exact reason for this high prevalence, it may be related to the fact that the city has a relatively large population (~2 million) with an active nightlife, (Susukino district, ~3.7 km from the hospital), which particularly attracts sexually active young people. We also found that the detection frequency in the youngest age group (20-24 years), who were more sexually active, predictably increased from 14.3% to 23.4%. 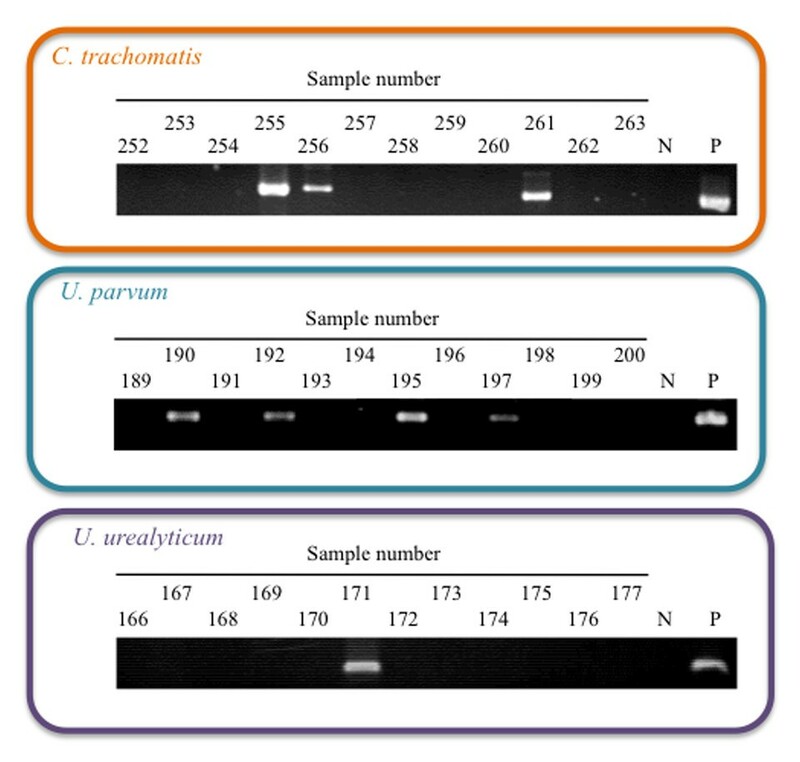 Detection frequencies of C. trachomatis, U. parvum and U. urealyticum in DNA extracted from genital swabs. PCR detection also revealed that the prevalence of U. parvum and U. urealyticum was 41.7% and 8.9%, respectively. Other studies with healthy women also have reported that the detection frequency of U. parvum and U. urealyticum was estimated at ~50% (57 and 87% Australia [13, 48]; 52% Japan ; 33.2 and 86.8% China ; 86% Italy ; 17.9% Poland ) and 10% (6.1-19% Australia ; 8.7% Japan ; 4.6-10.5% China ; 14% Italy ; 2.6% Poland ). The findings with our data suggested that the distribution of Ureaplasma is spreading worldwide and that the species are commonly found in healthy people as presumably commensal bacteria, therefore, their pathogenic role would be minimal [53–56]. Nevertheless, it has been increasingly reported that Ureaplasma spp. are associated with non-gonococcal urethritis, chorioamnionitis, preterm birth, perinatal morbidity, and mortality, more often than are normal flora [53–55]. Thus, our knowledge regarding the pathogenesis of Ureaplasma still remains paradoxical and is limited, suggesting that further, larger epidemiological studies with healthy people and patients with urogenital disorders are needed. The gold standard for bacterial detection from clinical specimens is probably culture; therefore, we also assessed whether C. trachomatis and Ureaplasma spp. in PCR-positive samples could be detected by using biological detection systems, IFU assay and urease assay, respectively. However, contrary to our expectation, the detection frequencies of C. trachomatis and Ureaplasma spp. in PCR-positive samples decreased to 30% and 2%, respectively. Although it is necessary to clarify the exact reason, it is possible that freeze-thawing of samples crucially caused a decrease in detection frequencies. Surprisingly, either C. trachomatis or Ureaplasma spp. was detected in almost half of the healthy women (52.5%, 147/280), and mixed infection with C. trachomatis and either U. parvum or U. urealyticum was observed in 9.2% (26/280) (Figure 2, See overlapping area). It is intriguing that there was a significant association between C. trachomatis and either U. parvum (p = 0.023) or Ureaplasma total (p = 0.013), but not U. urealyticum (p = 0.275) (Table 2). Meanwhile, several studies also estimated the mixed infection frequency; however, correlation between the frequency of C. trachomatis and either U. parvum or U. urealyticum was limited, and has been considered less serious in urogenital infections [56–58]. At present, we do not have any explanation to resolve this contradiction. It is possibly due to the particular experimental design, including detection methods such as PCR or serology, or a lack of accurate quality control for DNA extraction. Our study revealed that U. parvum had a significant effect on the presence of C. trachomatis in the genital tract of healthy women, suggesting that mixed infection is an important factor in bacterial pathogenesis of the genital tract. Meanwhile, whether this observation is limited to Sapporo City remains unknown. In addition, there was no difference of C. trachomatis frequency between U. parvum [20% (23/117)] and U. urealyticum [20% (5/25)] positive samples. This implies that U. urealyticum also may have a potential effect on the presence of C. trachomatis as well as U. parvum. As shown in Figure 3, we also estimated the frequency of ompA genotypes among C. trachomatis that we detected by direct full sequencing (n = 40). As a result, we finally determined the following C. trachomatis ompA genotypes: D (30%), B (2.5%), E (7.5%), F (12.5%), G (0.5%), I (12.5%), J (5%), K (10%), and undetermined (17.5%). Although C. trachomatis ompA genotype D was the most frequently identified, there was no association of the genotype with either U. parvum or U. urealyticum. 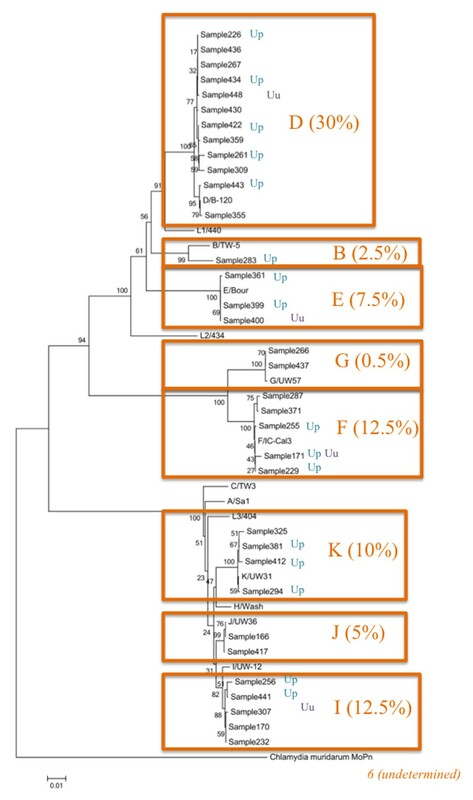 Phylogenetic trees showing the relationships between C. trachomatis ompA PCR amplicons and previously identified bacterial sequences. Orange letters (B, D-G and I-K), ompA genotypes. Parenthetical percentages, the prevalence of each of the ompA genotypes. Up (blue letters), U. parvum. Uu (purple letters), U. urealyticum. Undetermined, these samples failed to amplify ompA gene fully because of DNA degradation. Why does C. trachomatis co-infect with U. parvum in the genital tract? So far, we do not have any definite explanation. However, it is possible that the presence of U. parvum could provide some advantages for survival of C. trachomatis in the genital tract, possibly through directly or indirectly supplying tryptophan to overcome the depletion of this amino acid inside the cells by interferon γ exposure [59, 60]. Endocervical samples were taken from 303 women attending their first prenatal visit at a community hospital in Sapporo, Japan, and the extracted DNAs (n = 280), amenable to 16S rRNA PCR amplification, were analysed by PCR that targeted C. trachomatis, U. parvum and U. urealyticum. The prevalence of C. trachomatis, U. parvum and U. urealyticum was 14.3%, 41.7% and 8.9%, respectively. Mixed infection with C. trachomatis with either U. parvum or U. urealyticum was observed in 9.2% of the study population. Interestingly, there was a statistical correlation between the frequency of C. trachomatis and either U. parvum (p = 0.023) or Ureaplasma total (p = 0.013), but not U. urealyticum (p = 0.275). Thus, this study demonstrated that the presence of Ureaplasma had a significant effect on the presence of C. trachomatis in the genital tract of healthy women. We thank the staff at the Department of Medical Laboratory Science, Faculty of Health Sciences, Hokkaido University, for their assistance throughout this study. This study was supported in part by grants-in-aid for scientific research (21590474), and a research grant from the Institute for Fermentation, Osaka, Japan. TY and MM performed the DNA extraction and the PCR. TY and MM performed the biological detection. TY performed the purification of PCR products for DNA sequencing. MM and HY validated the statistical analysis. HY designed this study. KA and KM performed the sample collection. JM and HY supervised the practical work and the data management. HY wrote the manuscript. All authors approved the final manuscript version.